Author Jayne Denker is here and she’s going to share with us her amazing Apple Pie recipe. I cannot wait to try this one!! Yum! Before we got to that, here’s a little about Jayne! 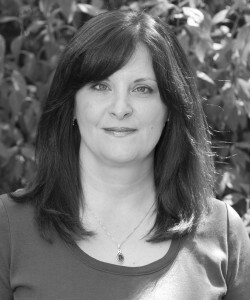 Jayne lives in a small village in western New York with her family and a very sweet senior-citizen basement kitteh who loves nothing more than going outside, where she sits on the front walk and wonders why she begged to go outside. When she’s not hard at work on another novel (or, rather, when she should be hard at work on another novel), she can usually be found frittering away stupid amounts of time on social media. Now bring on the pie!! George’s pies are made with the most amazing recipe that I learned in high school home ec. The class was taught by Sister of Mercy Sr. Mary Dismas. She ruled. How many other people do you know who could teach students how to bake, how to sew, and how to slaughter the New York State Regents exam in geometry, all with equal (fantastic) success? (Plus, when she was a missionary, she hung out with cannibals. She always had great stories.) Anyway, I’ve been using this recipe for many, many years. It truly is the best. Fluff flour with a fork, then lightly scoop into the measuring cup (do not pack) until overflowing. Skim off the excess till the flour is level with the top edge of the measuring cup. Mix salt into flour using the fork to keep the mixture fluffy. Cut shortening into flour with a pastry cutter. Sprinkle on water a little bit at a time. Mix first with fork, then hands. Press into a ball. You might want to refrigerate it overnight, but you don’t have to. Cut ball approximately in half—the half used for the bottom crust should be slightly larger. Knead the half to roll out for the bottom a bit, adding a little flour if it’s too sticky. Roll the bottom crust and place in a pie tin. Mix sugar, cinnamon, and flour together. Pour about three-quarters of the mixture over the apple slices in a large bowl and mix to coat the apple slices. Arrange the filling evenly in the bottom crust and sprinkle the rest of the sugar and cinnamon mix on top. Place pats of butter on the filling. 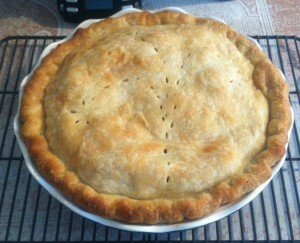 Knead and roll out the top crust and place it carefully over the apple mixture, crimp closed, and cut a vent. Bake at 425 degrees for almost an hour; check after 40 or 45 minutes to prevent over-baking. Oh man, I don’t know what sounds better—the pie or Jayne’s book! When it comes to love, she’s a professional skeptic. Is it too late for a career change? If there’s one thing Georgiana Down is an expert in, it’s bad relationships. That’s what inspired her blog, Down on Love, where she gives snarky advice–usually along the lines of “dump him.” In fact, George is abstaining from men all together. At least that’s the plan–until she makes a trip back to her tiny hometown in the Catskills, where meddling is an art form. . .
George loves helping out with her new baby niece, but she’s counting the days until she returns to Boston. Then she runs into Casey Bowen, her high school crush. The boy she once loved is now a handsome grown man–and suddenly George needs a little advice of her own. She’s in the right place, because when she drunk posts on her blog, everyone in Marsden has something to say about George and Casey. It’s like high school all over again–but maybe this time she’ll get things right. that recipes sounds so easy and tempting. Thanks. I might have to try this recipe next apple picking season! 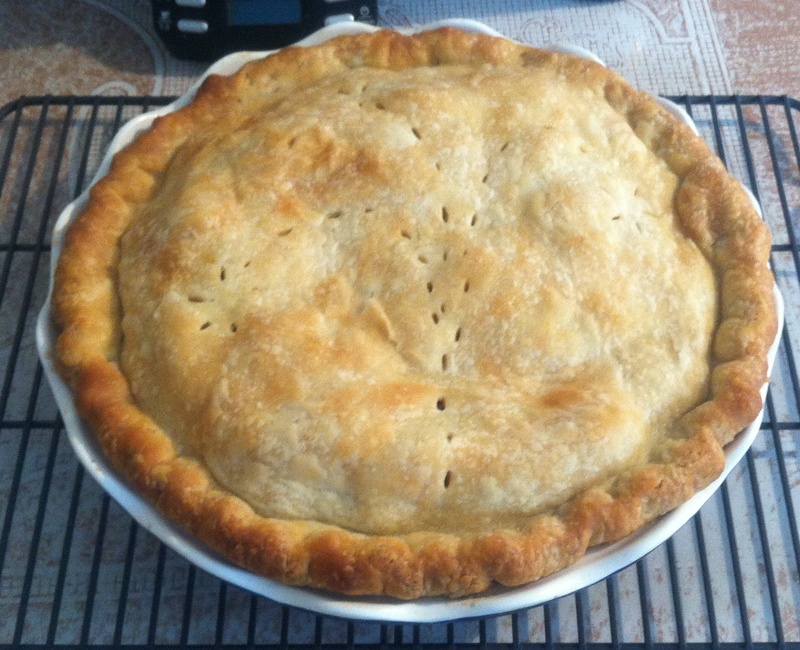 Apple pie and drunk posting – both sound like a lot of fun!